(Post)Sermon Notes: What Will You Do With What God Has Given You? So, we had some volume issues with our podcast posted this week, so I thought it was a good excuse to try to get some more (post)sermon notes up for those of you who like to follow such things. I will be doing the same next week, in lieu of a podcast (or a sermon for that matter!). So, I didn’t manuscript my sermon sermon this week. I just made four observations with questions at the end. I’ll try to link the points the best way I can to the scriptures they reference. We are all given gifts of great value, though we are not given the same things. We are expected to invest what we’ve been given. This investment means risk and a lack of clear instruction from the master. The servants had to figure out how to put what they had been given to work (or not). We can tend to justify our inaction/laziness with our own beliefs/theology. 24 “Then the man who had received one bag of gold came. ‘Master,’ he said, ‘I knew that you are a hard man, harvesting where you have not sown and gathering where you have not scattered seed. 25 So I was afraid and went out and hid your gold in the ground. See, here is what belongs to you.’ 26 “His master replied, ‘You wicked, lazy servant! So you knew that I harvest where I have not sown and gather where I have not scattered seed? 27 Well then, you should have put my money on deposit with the bankers, so that when I returned I would have received it back with interest. Many issues we create can be tied to what we believe about God or ourselves, that is simply untrue. We will be judged/rewarded in connection with how we put to use what God has given us into the world. -What are God’s desires in the world/for the world? -What can you do with what God has given you? What imagination do you have for investment of what you have? -What do you think God be declaring to you, in light of what is keeping you from moving forward? If you are afraid, what do you think God is saying to you in your fear? I’d love any thoughts you may have, feel free to comment or contact me directly through the site here. (Post)Sermon Notes: Would Anyone Want Your Life? So, we weren’t able to get our normal podcast posted this week, so I thought it was a good excuse to try to get some (post)sermon notes up for those of you who like to follow such things. I hope it helps you consider or re-consider what this life of follow Jesus might look like. How many of you are familiar with the movie “The Little Rascals”? The movie centers around little kids, particularly the boys who have formed the “He-Man Woman-Haters”. This is an exclusive club, with the big rule that you have to hate girls to belong. The two best friends, Spanky and Alfalfa, end up having a falling out because Alfalfa has fallen for Darla, and has been spending time with her in secret. It all comes out in an epic scene, where, while trying to have a secret date in the clubhouse, Alfalfa accidentally burns it to the ground because of his romantic lunchtime candles. 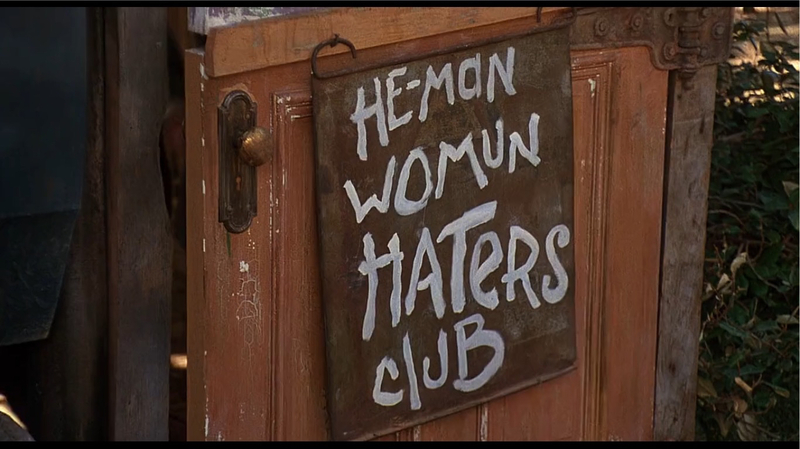 He is punished by the group, and it isn’t until the very end, through a surprise guest, that they realize they were wrong, finally rebuilding their clubhouse and hanging a new sign on the door: “He-Man Woman Haters Club: Women Welcome”. In the final scene, you see them all getting along so well, and even Spanky seems to enjoy the company of his female friends. In this movie, there was a strict rule that was preventing Alfalfa from pursuing the love of his life. And it was a nonsense rule (and even a dangerous one…we might admit that some organizations would be more honest if they hung a sign like the one at the end of the movie on their doors…). Alfalfa had been sold a bill of goods and he couldn’t do it anymore. It was not a life he wanted. And the damage it caused was extensive. I know the movie is a silly example, but the Pharisees and teachers of the law that Jesus is talking to have been doing something similar. They have been laying up heavy burdens on others, they have been seeking to exclude other people and convert people to their cause, and have been blind to the hurt and pain they are causing, not to mention the fact that they were causing themselves to miss out. There is a certain misery in seeking to always police the world and be right all the time. That is what is behind the word “woe”. Jesus is saying: this life you have chosen for yourself…it is not just misguided and destructive, it is sad and lacking. We don’t tend to hear the word “woe” often today, but they were used by prophets to name what currently exists in someone’s life. It is a statement of regretful fact with even a twinge of compassion. This is not simply judgment, it is a sorrowful statement of what is happening. It begs the question: do you really want this life, and would anyone else want your life? This is a key question for us as disciples of Jesus. Of course our lives have challenges and we are not perfect, but would someone on the outside looking in want our life? And if not, why not? This is a time for us to get honest about our own lives as we look at the lives of the Pharisees. Jesus begins by passing judgment on the scribes and Pharisees for the effect that their hypocrisy has on others. The kingdom of heaven is meant to be attractive and inviting, but the scribes and Pharisees prevent those so attracted to it from entering the kingdom. They do not live as if they have entered the kingdom. because they actually haven’t. But they feel like they have to prevent others as well. These leaders are so obsessed with holding on to their power and position, that they are trying to trip up and discredit Jesus so that the people who used to follow them (and now follow Jesus) will turn back to them. And how do they do this? Power and coercion. You aren’t following the rules. You aren’t keeping sabbath. You don’t really understand the Bible. Some of us have really felt this one. We have been indoctrinated into thinking and acting in certain ways where fear was a big motivator. If you do this, then it will lead to [insert worst-case scenario/consequence here]. The bar becomes set so high that we live in constant fear, shame, and guilt because we cannot measure up. And perhaps, there is even this twisted hope that if I share this enough, I will come to believe it and embody it, and maybe even the person I convert will prove that this is right! Quite simply put: this is a conversion to a Jesus-less religion. Keep these rules. Do things the right way. Believe the right things. Set yourself apart from those who believe the wrong things. There is nothing inherently wrong with describing our faith in relationship to our faith tradition. Someone will say I am Baptist or Catholic or Episcopal or Lutheran or Jewish or whatever it may be. There is such to be gained by identifying with a certain religious stream. However, when that becomes the thing that is more important than Jesus, we need to be careful and aware. A side note: this is one of the several times where Jesus mentions religious people being the ones especially in danger of being related to or of hell. This should make our ears perk up a little bit. The question is, what are we attempting to convince people of? A system of belief? A particular set of holy living codes? A specific morality? Or…is our message one that says: the kingdom of heaven is near and you can be a part of it…now. Pascal once said: “People never sin more grievously than when they act from religious motives.” I don’t feel like I need to convince you of this. So many wars have been waged over religious motives (even within the same Christian faith). Religious motives are fleeting and destructive, not just to others but also to ourselves. There is NOTHING about this way of living that is attractive to our world…and it is often where many people, apart from Jesus are living (and many who do confuse belief in Jesus). There is a better way. What does your life speak about what you believe about the kingdom of God? Is it an invitational life? Is it an attractive life? Could it be that you are closing a door in people’s faces by the way you are stuck right now in your life? Is God saying “woe” to your life right now, not in a way of judgment but in a way of saying “It doesn’t have to be this way.”? The truth is, the door to the kingdom is open wide for us. Jesus has opened it and he is inviting us in. He is the Door. He is the Way. And to follow him is to lay down our striving, our burdens, our guilt, our shame, our rules, the lies we’ve been telling ourselves and others, the expectations we have or others have. It is laying all of it down and it is surrendering to a life with Christ. What is preventing you today? What is the bad news in your life, the lies and stories you are telling yourself? What does God want you to know about him and about yourself this morning? What is the truth that makes life in the kingdom a joyful possibility? Note: I am posting a more manuscript version of my sermon because of technical issues with the podcast this week. This was delivered this past Sunday morning during our 11am gathering. Enjoy! On a Sunday similar to this one, in the early fall of 1946, the English novelist George Orwell stood at the front of a church, honoring the enduring legacy of one of the leaders in the Church of England who had recently passed away. Many don’t know this, but Orwell (his real name being Eric Blair) was a very committed Anglican, his faith influencing his writing. 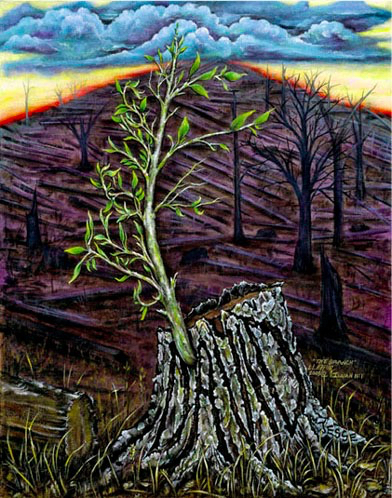 Before he came into the church, he noticed a large tree out front; one that had just started to show its maturity. Some children were climbing in the branches and playing under the shade. Setting aside Orwell’s loose lips and candor during a memorial service, the truth is a powerful one. We do not think to plant seeds for a future we will not get to experience. We are doing work, planting things which we will not see grow or mature. I first shared this quote almost two years ago in this very room as we jointly celebrated the 100-year anniversary of Patterson Park Baptist Church (and their final Sunday as a church) and the first official Sunday morning of Gallery Church Patterson Park. It was a beautiful time and we gave everyone a walnut seed as a way to remember that we are both beneficiaries and builders of the kingdom; a kingdom that did not begin and will not end with us. The disciples in the first century find themselves in a very similar place. The idea of the “kingdom of God” is not new to them. It has been in the collective conscious of the Jewish people for centuries. It is reawakened every generation with people who attempt to bring in the kingdom politically or militarily by force. It is anticipated as religious leaders come to gain power and influence with the occupying government, in hopes that they will one day plan a sort of coup to overthrow their oppressors. Yet, success would always evade them, and the consequences were not just loss, but death and often a tightening of the shackles on the people: more taxes, more oppression, more laws, more military. The prophetic words of Isaiah have become painfully true for the people of Israel. Isaiah’s call was to go to speak to a people. We love to read Isaiah 6 up until verse 9, because it paints a picture of the greatness of God and the incredible response of Isaiah to God’s call. “Here am I, send me!”. We love to use this to talk about missions and obedience. But you know what comes after Isa 6:8? Isaiah 6:9! The LORD tells Isaiah that he will be going to a people who would not understand or repent. As a result, they would experience the judgment of God. So, not only had Isaiah’s words come true (in a not so good way), they were also coming true (in a beautiful way!) in the person and work of Jesus. And the disciples are seeing this, but they want to understand why Jesus is speaking in this very strange way to others. So their question is this: Why did Jesus speak in parables? For us to seek to answer that question, we will talk about what parables are and what they do. Jesus is telling the parable about the sower, seed, and soil in order to communicate something that is happening in the kingdom right now. Again, we will deal with this more fully next week as to what this parable reveals, but Jesus says that these parables have to do with the mysteries of the kingdom of heaven. Parables are not simply just nice, cute stories that use something concrete to explain an abstract reality. On the surface they do that, but Jesus is not simply teaching to convey information. He tells parables to do something: to reveal the kingdom and who is in on it. As we will come to see more next week as we talk about the meaning of this particular parable, Jesus is describing something that is happening right now. So, I know some of you have struggled a bit this week with the questions I asked last Sunday, because I didn’t answer them for you. Someone asked me, “Are you going to answer all of those questions this week?” I’ll tell you what I told them: not yet, and I doubt I can answer all of the questions for you. Remember, we need to sit with our questions! We need to engage with Jesus teachings and allow them to do their work, not simply be problems for us to figure out! But our main question is this: what does the parable expose or reveal about life and God and me? If we seek to answer that, we are working within the given framework that Jesus has given us. But parables don’t just expose reality, they also reveal something else. I mean this more than just that they reveal something about God and his kingdom (that is covered in the exposition). They reveal something about the hearer (or better yet, they reveal who is a hearer). Jesus says that this way of teaching helps to fulfill the prophecy (and in some ways, the ministry) of Isaiah. Jesus chooses to teach this way in order to reveal who is really paying attention and who isn’t. The hidden aspect of the parables’ message is thus both a cause of and a response to people’s unwillingness to follow Jesus. Simply put, not everyone who hears the words of Jesus will understand them, abide by them, or follow them. And, of course, the disciples have a great advantage, having had the Sermon on the Mount given to them specifically. But parables in some ways are a very practical tool that allows Jesus to see who is really desiring this kingdom. Those who show interest, who understand the parables are showing that they are a part of this movement. But those who do not, reveal that they are not followers of Jesus or his kingdom. This, for me, comes back to the walnut seed. Jesus is exposing the place of privilege and responsibility that the disciples have in being able to see and hear and understand what Jesus is doing. To me, it is amazing that most commentators focus on this parable and ask questions about the previous verses in relation to the age-old questions of predestination and human responsibility or free will. I will not wade into those waters this morning for a variety of reasons, except to say this. Divine providence/election and human responsibility are both held in tension in the Scriptures. And, at the risk of over-simplifying things, when it comes to divine providence and human responsibility, by definition we are responsible for only one of those things! What I want us to see is that the idea of election: being chosen for a specific task by a specific person (in this case Jesus and his disciples) does not signify simply a privileged status. It is a “blessed status”, meaning, there is a great responsibility place upon you now, because of what you see and hear. Implicit in that statement is a “so what are you going to do about it” sort of question. Will you jump into the story that the God of Abraham, Isaac, Jacob, Elijah, Isaiah, and David is fulfilling now? Will you find yourself in this story and be changed by it? Will you be a part of this kingdom? Will you listen to me so I can tell you what it means? This invitation is ours today as well. We are inheritors of a legacy not our own; a kingdom we did not build, but we can join in and belong. This is historically significant! Jesus is looking to us and saying, so many people would have loved to be where you are now, but it wasn’t time. But now it is time. This is how Jesus began his ministry, calling people to him because the Kingdom of God is breaking into the world. That is happening right now, through the work of the Spirit in the church that Jesus started. So, do we hear this? Do we hear what Jesus is up to in the world? Are we seeking to listen to him? We will be moving from hearing to understanding next week as we (finally) talk about what this parable means. But let’s just take time to listen to the Spirit of God, right now in this moment. What is he exposing to you right now about himself and the Kingdom? What is he revealing about you? How is he inviting you into his work in the world this week? May we have ears to hear and eyes to see all that God is accomplishing around us in his kingdom. May we respond to his invitation to join him in his work, and may we realize that we are the inheritors of a past not our own, and co-stewards of a future that God is pulling most wonderfully into the present. May his kingdom come and his will be done, in Baltimore as it is in heaven. This Sunday’s sermon was a tough one for me to give. It wasn’t so much the difficulty of the text (more on that in a moment), but more the opportunity I took to share my plan for sabbatical this fall. To admit that I need rest and renewal is a tough thing to do. To admit that I need to have “ears to hear” the voice of the Spirit is even more embarrassing and revealing. I don’t know if “pastors” don’t like talking about these things, but I know its tough for me. But it really was in preparing to teach this text (Matthew 13:1-9) that I discovered something profound about what Jesus invites us to do as he teaches us. And it will be foundational for me as I move into this next season. He invites us to be good listeners by asking good questions and sitting with those questions for awhile. It was a tough thing this past week to simply let the parable in this passage do what it does. I wanted to skip ahead to later in the chapter when Jesus explains that this parable of the sower and the soils is not just a lesson in agriculture. I mean, after all, how infuriating would it be to get advice from a carpenter-turned-rabbi about farming? So, beginning in October, I will be taking three months to sit with my questions and feelings. I need to reflect on the past years of ministry. So much has happened in my life in such a short span of time. I feel like I experienced growth spurts but the rest of me needs to catch up. I will be asking God what he is saying and then shut up and listen to him, rather than trying to finish sentences for him. I will be seeing a spiritual director. 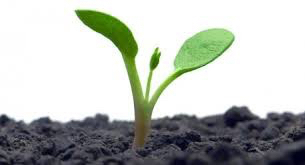 I’ll be creating space for this seed of God to take root in me (or maybe even change the soil some). I’ll be investigating some questions I’ve had for awhile. I’ll be visiting some friends I haven’t seen in a long time. I’ll be practicing discernment with others. I’ll be reading and writing for me, not for others (a tough thing to do, for sure). And, I’ll be shutting off the noise for awhile: social media, blogging, email, etc. In short, I’ll be seeking to have ears to hear. I’ll be posting a bit more until that time with some more info about what I’ll be doing, but until then, if you are the praying type pray for me. If you aren’t, keep me in your thoughts.